So yesterday I told you that the chocolate chip cookie throw down wasn’t quite over yet. No, I’m not actually adding another cookie to the lineup. But I’ve been telling you all week that one thing I want to be able to do with my perfect chocolate chip cookie is easily use it for cookies or a cookie cake without having to worry about making a bunch of changes. So I tested my fave as a cookie cake. My favorite was a tie between Sally’s Baking Addiction and Cook’s Illustrated for taste. For method however, I prefer the ease of Sally’s Baking Addicion, so that one moved on to the cookie cake test. 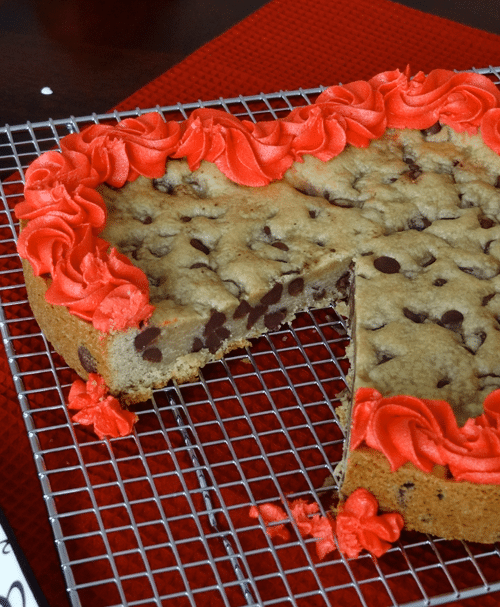 I used a Wilton 9 in heart cake pan for my cookie cake, given that Valentine’s Day is so close. I also used the full recipe for the cookies. I had a feeling that cutting the recipe in half would have not been enough dough, and I was right. But using the whole recipe does make a pretty thick cookie cake. So if you are into a thick cookie cake – and trust me it’s still soft and chewy and delicious when it’s nice and thick – go for the whole recipe in an 8 or 9 inch pan. In fact, a 9 in round pan might be perfect. Even though the heart pan I used is technically a 9 incher, when you put it up against my 8 or 9 in round pans, it seems more similar in size to the 8 in. So I’m thinking a 9 in pan would make a cookie cake that’s a bit thinner and just right. So now the throw down really is over! Go forth and make your favorite! Then report back and let me know what you think! 3. With the mixer on low speed, add flour, cornstarch, baking soda and salt. 4. Stir in chocolate chips. Dough will be thick. 7. Place parchment paper into the bottom of your cake pan to help the cookie not stick. 8. Spread the dough out into the cake pan. Bake for 18-20 minutes or until the edges are slightly golden. 9. Remove from oven and allow to cool mostly in the cake pan, then transfer to cooling rack to cool completely. 2. Slowly add 1 cup of powdered sugar. Mix until combined. Recipe from Sally’s Baking Addiction, originally from Apple A Day. I hace a question. How long lasts soft this cake ? I need one for saturday night but i have to do it on friday night. I want it t keep moist and chewy. Cani bake it on friday? If you make it Friday, it will still be moist on Saturday for sure. My mix looks dry what should I do I followed all the steps pls help??? It’s a very thick dough, so it might be correct. It’s hard for me to say without seeing it. If you think it needs more moisture, I’d add a tablespoon or 2 of milk. Looks awesome! I am going to make the cookie cake for an upcoming birthday! May it turn out as nice as yours:) Lindsay! Thank you for sharing. How pretty! My husband loves cookie cake!! This sounds AMAZING. I love a good cookie cake! This is so pretty too! This was awesome. I made this cookie cake for my 13 yr old daughters birthday. This is a keeper! Thanks Jill! I’m so glad you liked it!! Wow! That cookie cake looks so incredibly dense, chewy, chocolatey…in just one word: perfect. I want to buy a giant cast iron pan so that I can make a CCC cake in it to get that amazing crispy edge. I’ll just have to make this in my normal pans for now! Yum! This looks delish and now I want to make one too! I’m sorry Lacey. 🙁 Can you describe the problem? Maybe I can help you figure out what to do differently next time. That’s great Lacey! I’m so glad you were able to figure it out! So i made the chocolate chip one, and it unfortunately turned out a little dry and not quite as dense as yours. it was more like cake batter than cookies. Any thoughts on why? It could be that it baked too long. Other than that, if you included all the ingredients correctly, it’s hard to say why, I’m sorry. Love love love! Best cookie cake ever,I’m glad I found it! oh no – I hate to hear that! 🙁 It’s hard to say what went wrong. Strange that it was thick prior to baking and then got jiggly. Makes me wonder about the butter maybe? I don’t know. If you give it another shot I hope it turns out better! We had a snow day, so I tried again, and SUCCESS!! Not sure if I didn’t leave it in the fridge long enough last time, or just simply didn’t bake it long enough, but at this point, I don’t care because it is so yummy! Thanks for your help! Got my cookie cake in the oven right now! The dough tasted delicious but it was very hard to mold in the pan. Hopefully it turna out ok. I was scared I did something wrong because it is so thick. Any tips? Hi Lydia! That sounds about right. You definitely have to work the dough out in the pan – it’s thick! I hope it turns out great! What if you leave the dough in the fridge to chill for more than 24 hours? Will that ruin how it is supposed to turn out. Thanks! Hi Gwen! No it definitely won’t ruin the dough. You can refrigerate it for a few days and it’ll be fine. Longer than that and you could freeze it. It should be good frozen for up to 3 months. Can’t wait to try the cookie cake over spring break and then for my son’s 12 year old birthday! Thank you, it looks wonderful! Hi Lindsay — what tip did you use to frost your cake? I love your decorating. Made the dough yesterday and going to bake today. Thanks in advance! Thanks Amanda! I believe it’s the Wilton 2D. Enjoy the cake! Could I just chill the dough in the pan I plan to cook the dough in? Or do you not think that would work? Hi Lauren! I’m not sure. The purpose for chilling the dough is to allow the flavors and ingredients to all come together. It should lend a cookie that rises better and has better texture. If its laying flat In a pan, I’m not sure if it would affect how everything comes together or not. Do I cool it in the bowl I mixed in or on parhment paper? Either way should be fine. I make mine into a ball and wrap it in saran wrap. Is there any way there could be an oatmeal raisin version of this cake?? My husband loves cookie cakes, but is not a huge fan of the traditional chocolate chip cookies. I think you might be reading my mind 😉 I’ve been working on an oatmeal raisin version – I LOVE oatmeal raisin cookies. Hopefully it will be up in the next few weeks. Hey Amanda! Just wanted to let you know I posted an oatmeal raisin version today. You can find it here. Thanks Kara! I’m so glad you liked it! Hi I’m making this now and the dough didn’t come out thick at all? It’s crumbley? I have it in the fridge cooling. Is there anything I can do to make it thicker? Thanks! Hey Ashley – I’m not sure. Did a wet ingredient get left out? Thanks Nicole! You are so welcome! Wow! Used this recipe for my eldest son’s birthday cookie cake. It was amazingly good! My youngest has already asked for it for his birthday. Thanks for comment! I’m so glad you all enjoyed it! This is now my go-to chocolate chip cookie recipe. THANK YOU!! I made it as a cookie cake for my brother-in-law’s birthday, and none of us could stop eating it. Absolutely delicious (and I didn’t even have dark brown sugar on hand. I can’t wait to make them again with dark brown sugar!)!! Just wondering if I would have to use a cake pan? Could I just spread it out on, like, a pizza stone? Or do you think it would melt all over the place? I think you could use something else. It should be alright. I’ve used the dough for regular cookies and it doesn’t spread much. I’d be sure to leave space around the edge though. And I’m not sure how a pizza stone would affect the way it cooks. A pizza pan might be better. Do you think I could double this recipe to make an even larger cookie cake? Yep, that should work fine. You may need to cook it longer though. I dont have any parchment paper on hand, do you think just spraying the pan with PAM would work okay? I am using a 9″ Calphalon pan. Thanks! The cookie will bake fine. You just might have trouble getting it out of the pan easily. I’ve always used parchment, so I’m not sure. Does this freeze well after being cooked? I’m not sure, I’ve never frozen it after cooking. It’d be best to freeze the uncooked dough (should be good for 2-3 months frozen) and cook it when you need it. I’m sorry but this recipe is terrible! I have a great recipe for chocolate chip cookies and never have a problem with them, and I’ve been baking for years. I thought I’d try this recipe to see how it compares, and wow, really awful. There is way too much salt in this recipe. They’re bitter and not chewy. Would not make again. Fun idea for the cookie cake, but that’s about it. Hi Marie, I’m sorry this didn’t turn out well for you! I’ve yet to have that response. It’s definitely a family favorite for us. Maybe try again without the salt? Either way, thanks for stopping by! I’m sorry it didn’t turn out. What a bummer! There have been some other comments from people who tried a second time and had better luck. I know many have loved it. One other person had it turn out dry the first time and realized she didn’t include the baking soda. So happy to have found this one on Pinterest! I’m surprising my husband with it for his birthday and actually doubled the recipes to make two cookie cakes – one to bring up to work for him & his co-workers to enjoy and one for the family dinner we’re having later this evening! The dough tasted D-I-V-I-N-E! I had to pull myself away from just eating that!!! Now it is chilling and I am beyond excited to make the cakes! Thanks for sharing the recipe! I did a trail run of this because my son wants a cookie cake for his birthday. I cooked it in a 10in pan for same amount of time and it was still soft and delicious! One question though, if I were to make a chocolate cookie how much cocoa should I and and when? And should I leave anything out? Thanks so much! I’m glad it was a success! I haven’t actually added cocoa before so I’m not sure how much you’d need to add to alter the recipe. The cornstarch helps the cookie retain its soft and chewy texture. You can leave it out, but you don’t need to add flour. Sadly this did not turn out for me. The texture was all wrong. Completely gooey and under-cooked in the middle, and near burnt on the edges (I did bake it for 23 minutes since the middle was clearly not done). I followed directions (except for the cornstarch) and everything seemed good until it was time to pull it out of the oven. Oh well! I’m sorry it didn’t work out Nicole. I wouldn’t think the cornstarch would make that much of a difference. I don’t know if you refrigerated the dough or not, but I really think that helps all the ingredients come together better. Maybe give it another shot one day – it’s excellent when it comes out right! When cooling the cake do you leave it in the pan even after its transferred to the cooling rack? Or flip it over to take it out of the pan to cool? I’d let it cool for a while in the pan so the center can firm up a bit. You can’t really leave it too long. When you remove it, do it carefully because the center is very moist. 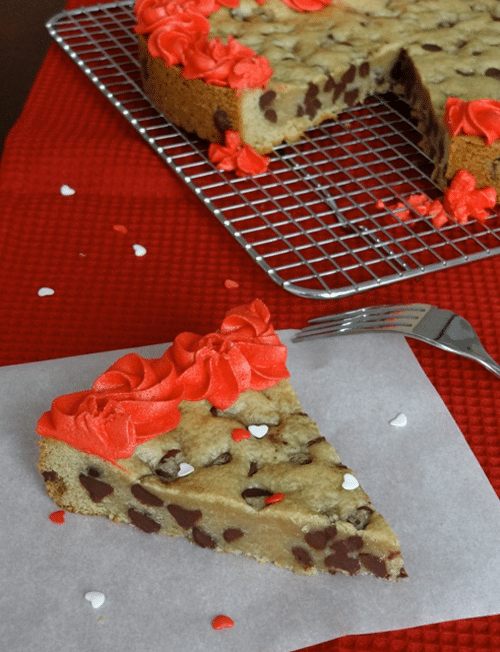 You gotta love a cookie cake, especially one that contains chocolate chips. Great job decorating too! This sounds delicious. Great post! Thank you so much for posting this!!! This is, by far, the best cookie cake I have ever had! Chocolate chip cookie cakes are my weakness and since I have this I will NEVER buy another cookie cake again. Since my first one for my hubby’s birthday at the beginning of June, I have made about 15 of these for different occasions =) Everyone requests them! So yummy! Hi! I tried your recipe yesterday and the cookie recipe itself is delicious!! But my issue was that it turned out light and fluffy instead of firm. It’s really really yummy but I just wondered what could’ve made it fluffy? My hubby REALLY liked it. He said, “this is good, hun. It’s really moist.” Lol so at least he didn’t notice it was screwed up!! Haha!! I used light brown sugar because that is all I had. Is that why??? Thanks!!! Hi Shelby! I’m glad it tasted great! It’s hard to say why that happened. I don’t think the sugar should have a big effect on it. Great! I’d love to know how it turns out! Hey, it turned out great. My pans were a bit small so we ended up with two cookie cakes. We iced them with blue and green buttercream icing and added some muticoloured sprinkles. One of them is already gone, we decided to save the other one for dessert tomorrow. Great recipe, we will be making this quite often. The kids loved it!!! That’s great Tequilla! I’m glad it was a hit! Hi! I was so excited to make this for my boyfriend! I mixed it all up earlier this morning and it seemed really dry like there wasn’t enough liquid to make it a cookie dough. So I stuck it in the trudge for a couple hours, baked it and I’m so disappointed!! It still looks uncooked and dry. The chocolate chips have melted nicely but it looks like a dry desert! My boyfriend said he would still eat it but I’m not sure what I did wrong!! Any advice for my next attempt? Hi Rachel, I’m sorry it didn’t turn out. Its so hard to say what it could be. I hope you’ll give it another try! Gosh, I’ve never tried that. I have no idea. You’ll want to make sure the bottom of the cake (the part you’ll see on top while it’s baking) is level, otherwise it won’t sit well on a flat surface after baking. You might need more than one recipe worth of dough, depending on the size of the pan. I’d also let it cool completely before removing it from the pan to help it hold together, so make sure you grease the pan really well. I’d love to know how it goes! Good luck! Do you know of a gluten free oatmeal raisin recipe that would work? Can’t have gluten or chocolate, missing great desserts. HELP! I know there are some out there, I just haven’t tried any so far. I’d love to post some gluten free recipes but haven’t made the leap to go find all the ingredients I’d need. I hope to do it soon though! I made this last night for my fiancees birthday. We absolutely LOVED it. It was the perfect consistency and I am very picky about my chocolate chip cookies! I added M & M’s because I love M & M’s in chocolate chip cookies and I also sprinkled sea salt on top of my cake as well! I served it warm with vanilla bean ice cream…hard to beat. thank you SO much for a terrific, fool-proof, easy-to-follow recipe! This recipe is definitely a keeper and I look forward to the next time I make it! You could grease with butter and flour or a spray of some kind, I just prefer the parchment paper because it’s guaranteed to not stick. Hi Kasie! I actually did a post a while back on cake in a sealed jar. I think if you followed the same method so that the jar sealed, it’d work great to send. I’d say shelf like is about a month or so. I just made this yesterday for my husband’s birthday; he’s a chocolate chip cookie cake fanatic, so I was nervous trying a new recipe. (Recipes in the past never turned out too well, so I definitely needed to try a new one.) It was AMAZING. Truly amazing – couldn’t have turned out ANY better! Chewy and soft on the inside, but with a bit of a crunch on the outside…just PERFECT! I followed the ingredients in the recipe exactly, but I baked it just a tad longer (since my oven tends to work that way) and I just used a bit of Pam on the pan instead of parchment paper. Seriously – this was SOOOO delicious. He brought a piece in for his boss and he loved it, too. THANK YOU SO MUCH!!! 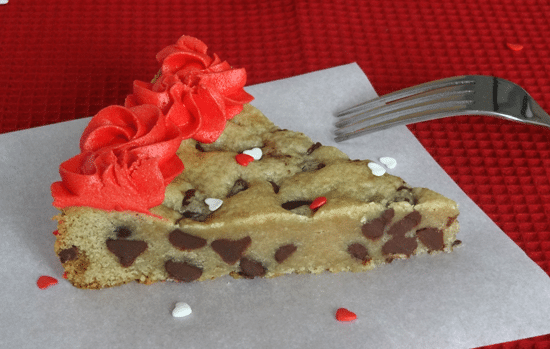 This is now my go-to recipe for chocolate chip cookie cakes! If I make the dough tonight, bake it tomorrow, but don’t serve it until the following day, do you think it will get stale? Excited to make for my son’s bday, but we are going out of town so I want it to be ready. Not at all! It’ll still be great! I did this cookie last night. Doubled the recipe for a 14 inch cookie cake and it came out beautifully! I reduced the heat a little to accommodate for the extra, pressed and smoothed it into the pan well and it only took about 30 minutes or so. The middle wasn’t as firm as the edges but that’s the way a good chewy cookie is supposed to be. I let it cool and set up and it’s perfect! Golden brown middle with edges that are just a bit darker. About to decorate it and get it going! Thanks for a great recipe! I’m using a 14″ pan, instead of a 9″. Do I need to adjust the cooking time? If you aren’t doubling the recipe, I’d say you could cook it less time since it will be thinner. You’ll just need to keep an eye it. Once the edges look golden, I’d remove it from the oven and let it cool in the pan. I followed the recipe as written, baked it in a 9 in. pan, and even decorated with red icing (at my son’s request) and it was fabulous! I made it for my 3 yr old’s birthday and we all loved it! Thanks for the great recipe! I’m about to make this recipe because I want cookies but don’t want to run back and forth to the oven! I may be documenting this adventure because this sounds amazing! Thanks for the great idea! I am an avid and experienced baker. However I’ve never ventured into cookie cake land. I tried this recipe in a 9″ tart pan for easy removal. After 20 min the outside was beautifully golden so I let it cool a bit and poked it and it was still very doughy… I have replaced it in the over with tinfoil over it to prevent further browning ontop but have others had this problem? I’ve read the compents and seen people have an issue with dryness but not overly doughy. And suggestions? I’m not sure why that happened Ashley. It certainly can seem undercooked in the center until it firms when cooled. How did it end up turning out? It ended up cooking for about 45-50 min but it turned out great. I am annoyed by baking defeat so I made another one and used less of the dough in a 9″ round and cooked it only 20min and it turned out great too. Now I have leftover dough to eat so it’s a win-win. Thanks for the recipe I’m adding it to my chocolate chip cookie list. I also like the buttercream it will be replacing my current buttercream recipe. This was such a delicious recipe! My husband said it was exactly what he thinks of when he thinks about a cookie cake. He said it was the best cookie cake I have ever made! Thanks for sharing!! Awesome! I’m glad it was a hit, Jamie! Any suggestions for a 13×9? I want to make for my sons third birthday next weekend. Thanks! I’ve never tried it before. I think you’ll probably need to double the recipe. Then just watch it while it bakes. It might take a little longer, but look for the edges to be lightly browned. The center might still seem a little underdone, but will firm up as it cools in the pan. Great, thanks! I’ll double and try on Friday- I’lll post back to let you know!! Turned out GREAT! Lots of compliments and tasted yummy. Thanks for the recipe, doubling worked out well. I plan to make this for my son’s second birthday. He loves Mickey Mouse so I was going to bake in an 8 inch and then maybe use two 4 inch pans for the ears and then outline the entire thing in chocolate buttercream. Would you think doubling the recipe would be better than spreading it thin among the 3 pans with the recipe as written? Thanks so much! Hi Jennifer, yes I only line the bottom of the pan. I made this cookie cake for my son’s 6th birthday and did a buttercream Lego StarWars transfer on it…it was AMAZING!!! We all love it and he declared it the best cookie cake he has had yet! Thanks for sharing your recipe! I am making this next week for my daughter’s birthday sleepover. Planning on doubling the recipe and using a wilton aluminum 14″ pan– do I need to grease the sides of the pan in addition to lining with parchment? Thanks! Actually- thinking of a 12″ pan option too. Maybe 1 1/2 recipe? Would a 9″ spring form pan work? I just made this today and it was a big hit! It was a little time consuming, but it turned out perfect! Do you think it would turn out with salted butter and regular brown sugar? That’s what I have on hand. If not I will just wait! Thanks. Definitely. Just take out the rest of the salt in the recipe. The brown sugar will be good. Enjoy it! I made this dough last night and put it in the fridge, I checked it this morning and it seems really hard is that normal? Yes, it is normal. Just set it out for 15 minutes or so to soften a little before putting it into the pan so that it’s easier to work with. Made the cookie cake last night and it was delicious! For the folks who say theirs turned out dry, I would think you may have over-baked it. Pay close attention to the time. I dipped a toothpick in the middle at 20 minutes and it came out clean. But it continues to cook a s set just a little more as it cools. I left it in the 9 inch pan to cool (while we ran out), and it was perfect and delicious! Can’t wait to try the other varieties next. Thank you for this great recipe! Made this today with my girls and they had a great time mixing up the ingredients. Just had a delicious, moist piece. YUMMY!!!! Hi!! Did you double the recipe and cook it in a 14′ pan?? If I do not double it how many do you think it would feed? Also, if I do not double it I could bake it in any shape 9′ pan?? Thanks! Making these cookie cakes may become my latest obsession!!! Hi Jarrelle! They are all great cookie cakes – and there’s another coming tomorrow 🙂 I haven’t done it in a 14 inch pan, but I’d think you’d need 2 or 2 1/2 recipes worth of dough to do that. A 9 inch pan is perfect for one recipe – that should be about 8 people. Awesome! I’m so glad you liked it Lisa 🙂 Gluten and dairy free versions are a great idea! I haven’t played around with that yet, so I don’t have any suggestions but I’d love to try that too. I just looked up Sally’s recipe on her website and she lists 1 egg plus 1 egg white…does it make a difference? I noticed you list just one egg. Not sure which is better or what the difference would be if I omit the egg white. Thanks! Hi Claire! I thinks that’s Sally’s new version. This was made from her old one. If you look underneath the recipe above, I have a link to it. I’ve never tried her new version but I’d think it’d bake fine. Either way, it should be delicious! I made this last week in a cast iron pan. Soooo good! I didn’t have any cornstarch, so I just nixed it and it didn’t affect it one bit. Will definitely be making this again! Awesome! What a great idea to do it in a cast iron pan! Hi, I want to try this recipe but am wondering if I need to make any adjustments for high elevation? I live at almost 6,000 feet above sea level. Thanks! I don’t really know much about baking at high elevations. I’m sorry Nikki! Hey Nikki! I live at 5280 ft (Denver) and made this no problem without any adjustments. Good luck! Thanks Chelsea!! It’s my birthday week so I think I’ll go ahead and try it out!! I made this tonight to test out for my son’s 8th birthday party. Since we have 20+ guests coming, I doubled the recipe and made it in an 17X11 inch sheet pan. I baked it for 18 minutes but it maybe could have used a bit more time for the middle to set up a bit more. It is TOTALLY delicious. My son told me A) I was the best baker in the world, B) It was the best thing he had ever eaten and C) He may dream about it, sleepwalk and eat it. But I can’t blame him for eating too much of it because he was sleepwalking. Thanks so much for your recipe!!! I have made two of your cookie cakes so far and my family is obsessed! the triple chocolate is out of this world! My husband said if we weren’t married he would put a ring on it because of these cookies lol thanks a million! Haha, awesome!! I’m so glad they are all a hit! I love cookie cakes! Hi Kitty, it’s definitely soft in the middle when it first comes out of the oven. As it cools, it should firm up and be nice and chewy. I sometimes let mine cool completely right in the pan. I’m so glad you liked the cookie cake, Gina! I’m baking it now, will it still be soft and fresh in 30 hours? So just over a day after baking? Yes, it should still be great. Hi, i’ve never had a cookie cake before, but i love chocolate chip cookies and this recipe blew me away!! I ran staright to the grocery store 5mins after reading this to buy the ingriedients. Im gona bake one tonight, & if its successful i’ll be making it for my sons 2nd birthday. My sons party is gona be a truck themed one and i dont know what flavour cake to make and this is something new and apparently very tasty. Im just not sure how “high” it will be if i double the recipe, as i was also gona cover in a thin layer of chocolate butter cream, cover with fondant and decorate. I then plan to put a small truck shaped cake on top. Would this work out?” or should i stack a cookie cake on top of a chocolate sponge cake? Would this option give it more hieght? Will the cookie+sponge cake combo covered in a little chocolate buttercream icing and fondant work well. Im so sorry for the very long post, im new to baking but very keen to bake my sons cake myself. Wow, sounds like whichever way you go your son will have a great birthday cake! It might be hard to get a full sized cake by doubling the cookie. Stacking it with a cake would probably be better. And depending on the density of the cake, you might want the cookie on the bottom – it’s heavy because it’s so dense. Can I do without cornstarch? I’ve been so excited to try this recipe! I made the dough tonight so I could bake tomorrow and bring in to work the next day….but I realized after I’d finished mixing the ingredients that I added 2 tsp of baking soda instead of 1 🙁 Any idea if this will turn out alright, or do I need to double the recipe at this point? I am looking for a chocolate chip cookie cake recipe for my daughter’s preschool graduation party. I need to plan for about sixty. Your recipe sounds great, but I was hoping it would work in 3 jelly roll pans (10×15). This would make the cookie only about 1 inch high. Do you think one recipe would fill one pan or should I make 1 and a half recipe for each pan? Also do you think they will be dry or crunchy if they are thin like this? We also like soft and chewy cookies like you do. It looks like the best recipe I’ve seen! Would love to use it! Thank you! I think it should be fine to use jelly roll pans. Just be careful to leave enough space on the sides for the cookie to spread a bit. Thinner cookies should be fine, you’ll just want to reduce the baking time to keep them from getting too crispy. The center is usually still jiggly when you pull it out of the oven and it continues to cook and firm up as it cools. So don’t wait to pull it out of the oven until the center is set or it will be overcooked. If you’re worried about the thickness, you could always make extra dough to use if needed and then if you have some left, freeze it in little balls and pull them out later to make chocolate chip cookies. Hi, I just made this and looks great but it’s sort of greasy on the too and squishy except for the edge. It’s been out cooking for like 30 mins. I put it in the fridge and hoping it’s all good tomorrow morning. Thoughts? Did I make it ok? Thanks! It’s normal for it to be jiggly when you take it out of the oven. It only firms up and fully sets once it’s completely cool. It should be fine. I made the chocolate chip cookie cake for a friend for her daughter’s birthday and it was a hit! I baked it in a 10″ spring pan and it turned out great! With the spring pan I didn’t have to worry about it falling apart when I took it out of the pan. Just pop open the spring, lift off the sides and slide the cookie onto the serving platter to decorate. Super easy! This recipe is a keeper! Thanks so much for posting! I’m so glad it was a hit Gina! This looks awesome. Can’t wait to try it! Can you use light brown sugar instead of dark brown sugar? Hi! Do you think this recipe would work out in a silicone baking pan? Would I need to adjust the time? Should I double the recipe? I have never tried a silicone baking pan, but I’m sure it’d be fine, I just can’t really advise. Yum! 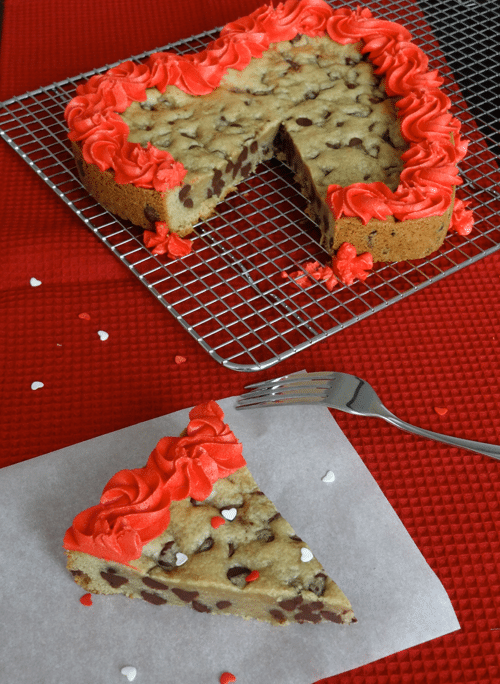 This cookie cake looks perfect! Just made this cookie in a 9 inch cake pan. Had to bake for about 5 minutes longer than the recipe says though to ensure the middle baked. The dough was VERY dry – in fact, it didn’t hold together in the bowl. I actually had to doublecheck the recipe because I thought I forgot something, like an egg or a wet ingredient. I used my hands to mold it into a big ball then refrigerated it for an hour. When I took it out I let it soften for a bit then spread it in the pan using a big metal spoon. It was so hard to flatten but I did it with some effort. Once baked and cooled, I cut it into a big heart shape. I halved the frosting recipe and it still made more than enough. I could have even just made a quarter of the recipe and still would have had plenty . I froze the remaining frosting for another cake. Lindsay – I would recommend that you indicate that in the frosting section….that it makes way more than you need. The cookie and frosting were both delicious though and a big hit. I will definitely be making again! Hi Ann, I’m glad you enjoyed it. The dough is definitely firm. You could add couple tsp of milk next time, if needed. Also, I know the middle tends to look undercooked, but it continues to cook as it cools and will firm up. Cooking it too much longer can make it dry. I did go ahead and reduce the icing recipe – thank you! This recipe was amazing!! I used all butter and a little bit of salt in the frosting to cut the sweetness a little but it was so so good! I was so excited to try this delicious looking cookie cake! Unfortunately, mine came out gooey no matter how long I baked it. I noticed someone else had the same problem. My refrigerator must not be quite cold enough, because the dough was still very sticky when I tried putting it into the pan. Since it had been over 30 minutes, I didn’t think much of it. Oh well! Now I just need to try it again but perhaps just refrigerate it overnight to be sure. I’m not sure why that happened. I’ve made this cookie cake many times and haven’t had that happen. It shouldn’t be the refrigeration. I sometimes skip that step and it still bakes well. I will say that the cookie will look a little undercooked when you take it out of the oven, but it continues to cook and firm as it cools. This will be year #3 that I have been making this cookie cake! I made one for my boyfriend last year and there was no question that he wanted another one this year. I don’t make my own frosting but I have a friend making some for me this year. Very excited to taste it with the homemade icing! Thanks so much for sharing this amazing recipe! My dough isn’t thick enough I guess? Everyone is talking about how dense it is, but mine isn’t…any idea why? It’s very hard for me to say without being there to see the dough and how it was made. I’m sorry. Can you shape this into a football and bake it on a regular cookie sheet, or will it spread? It would likely spread too much. That should be fine. It’s usually pretty soft for at least a couple days. This looks delish!! 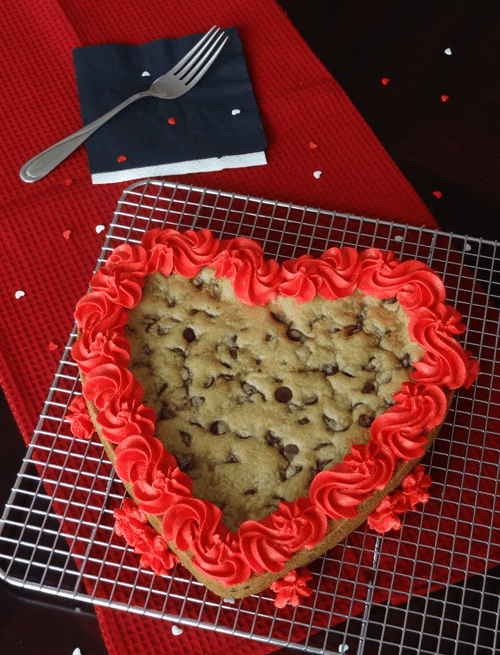 Do you have any other cookie flavor recipes for this heart shaped cookie? 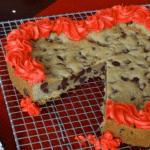 I was thinking making this heart shaped cookie cake with a Funfetti recipe, do you have? Thanks!! I do have a funfetti version actually. 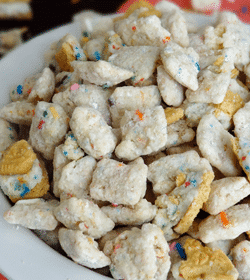 It’s made with a box mix to give it that same funfetti cake flavor. I refrigerated the dough like the recipe says and pulled it out to bake it and it’s hard, too hard to remove from the bowl. I think that part needs removed from the recipe. This is so awesome! I make it for my husband’s birthday every year on a cookie stone. Never have to go to the mall again way better and healthier than the cookie company’s! Do you have a cookbook? I did a test run on sunday and it turned out delicious. I will back it on friday for my daughters birthday party. For a 12×18 baking sheet would you double or tribel the ingredients?? I definitely like how thick it is makes it taste very rich. I did end up triple the ingredients and it was perfect. Big hit at my daughters party. Thank you so much for sharing if i knew how to add a picture i would show it to you. I haven’t frozen it before, but I do think it’d be fine. I made the dough a couple of days ago haven’t gotten a chance to cook it would it still be good? Thank you so much! Yes, it should be good for several days and could even be frozen for a few weeks. this seriously looks like my own version of HEAVEN. 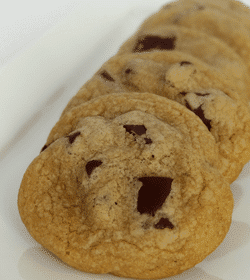 i love soft and chewy chocolate chip cookies! I have made it as a cookie cake and it was soooo good! This time I want to make it as cookie cupcakes for my son’s birthday. Any idea how long I should bake them? Thanks! For cookie cups made in a cupcake pan, I usually make balls of dough about 2 tbsp in size and bake for 10-12 minutes. I’m making them in a standard cupcake pan. Would the be 1 ball in each cup? Thanks again! Yep one 2 tbsp sized ball per cup. This is my go-to recipe for cookie cake! I have made it many times, even using Namaste gluten free flour and it turns out beautifully! Melted butter would change things, as it wouldn’t cream together with the sugar. You can use either light or dark sugar – that’ll be fine. I’ve made this recipe before and it turned out amazing. However I made this again and I felt like the dough may have been more moist, before the chilling in the fridge. I added a bit more flour. But it seems to be a little more sticky for my liking. I did follow the recipe to a T. Is this normal? Could I split this recipe into 2 9 in pans and shorten baking time for a thinner cake? Would it still be as moist? I need to make a cake that has a cookie layer on bottom white cake in middle and cookie layer on top, so I worry about the weight of the cookie cake. Thanks! Hi, I’m wondering how long this should stay fresh? My son is going on a school trip during his birthday week, so I need to bake on Tuesday, but it won’t be eaten until Friday. And not possible to fit in a fridge….. And how should it be stored? Is it ok to just leave it in the pan and use cling wrap around it? I would think it’d be ok. I might start to seem not as fresh, but should be fine. I’d recommend, since it’ll be a few days, to keep it in an airtight container such as a cake carrier. Keeping it in the pan with cling wrap will likely not keep it as fresh for that length of time. Hey there, I’m interested in baking this. Would you say the texture is more like a cookie or a cake? Based on your post and comments it seems like it would have more of a cookie texture (thick and chewy), but thought to double check. I would say it’s more like a cookie.